Return to main article: "Drones to the Rescue!" As this article points out, if one is willing to safely use UAVs, then a key indicator to account for is integrity. Commonly, UAV navigation is performed with differential GNSS processing, in the form of RTK, which lacks integrity measures. Hence, integrity is (or should be) of high interest for UAV platform operators, as it might even be mandated when demonstrating compliance with future safety regulations. In this regard, two key statements define integrity: precision is below tolerances, and no faulty measurements are used. The first statement is inherently related to SBAS systems. The use of EGNOS enables the computation of protection thresholds in position, called protection levels (PLs), in the horizontal and vertical subspaces. These PLs are directly derived from the precision estimation and scaled up by a factor to account for a certain level of risk, the so-called integrity risk (IR) (See the paper by B. Roturier et alia in Additional Resources). Thus, by comparing the PLs against a set of ‘tolerable’ thresholds called horizontal and vertical alert limits (HALs, VALs), the user can measure the safety level achieved when navigating. Note that, because the PL concept is “precision-based,” it can be fully applied to multi-sensor navigation solutions and not restricted to GNSS-only navigation. The integrity frame defined by the IR and the ALs is well established for highly demanding applications such as civil aviation. However, analogous requirements for other applications have not been fully developed, and accomplishing this will not be a trivial exercise. Other platforms such as cars, trains, and pedestrians are likely to benefit from integrity concepts but have much looser safety requirements (see the paper by S. Pullen et alia). UAVs also need to develop integrity requirements, which has been a motivation in CLOSE-SEARCH. The recent paper by P. Molina and I. Colomina (see Additional Resources) outlines a set of integrity requirements adapted to the needs of two flight phases in SAR missions employing UAVs. These requirements are presented in Table S-2 (at the top of this article). Civil aviation APV-I values are also provided merely for comparison, as they correspond to actual EGNOS certification requirements. On one hand, the presented ALs are based on the mission requirements such as overlap of thermal images to seamlessly scan a certain area or minimum distance to ground to activate a UAV’s landing sensors. On the other hand, the IR specification is a preliminary value, reflecting the idea that the risk in UAV missions can certainly be less restrictive than civil aviation. 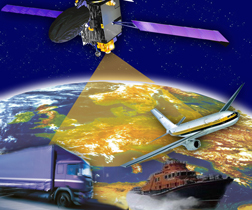 During the final test campaign of the project, protection levels were derived from the EGNOS-GNSS/INS/BA solution. The results showed that choosing an IR of 10-3 and HAL, VAL of 10 meters, the availability (that is, the percentage of time that PLs are below ALs) is around 95 percent. That is to say, a UAV can safely fly down to 10 meters above ground, with the risk of “something goes wrong and undetected” remaining lower than 1 over 1000 during the 95 percent of the time. Indeed, these results need further improvement, and the proposed integrity values need to be finally confirmed. The latter statement regarding integrity values is related to the fact that precision might be an untruthful measure of accuracy when faults in the observations are present. Indeed, computing PLs using EGNOS information offers protection up to a certain level, accounting for orbit and satellite clock errors, ionosphere, and so on. Nonetheless, other errors may be present at a local scale (for example, receiver noise, multipath, and interference), and the fault list even increases when other sensors are added, such as IMUs, barometers, or magnetometers. This consideration motivates the need for outlier detection capabilities to detect faults in the measurements and, if possible, to exclude them from the navigation solution computation. Classical geodesy offers well-established techniques to proceed with quality control in least-squares estimation, including outlier detection, estimation of marginally detectable errors, and fault impact on parameter estimation. These concepts were introduced by the Dutch geodesist W. Baarda in the 1960s. Again, as in the precision-based integrity, the set of thresholds to be defined in the outlier detection and exclusion (basically, the probability of false alarm and missed detection) are still unclear for low-altitude UAV applications. In continuation with the work performed on defining suitable ALs and IRs for UAV navigation, the authors will further study the use of geodetic quality control techniques and work toward defining the frame of an outlier detection and exclusion method for such platforms. Finally, GNSS multi-constellations are also safety enablers in UAV-based SAR operations. In rough terms, the more satellites in view (as will be the case in future GPS/Galileo, GLONASS/Compass . . .), the better the accuracy and precision (as already seen in the simulations presented earlier) of platforms using them to navigate. And more satellites also improve the chances of continuously operating in “obscured” environments (as those imposed by SAR missions, where flying below the peaks of steep mountains is a common situation). Indeed, further investigations need to follow on the potential benefits of future GNSS systems for unmanned platforms in SAR missions.